Maybe one reason New Orleans seems to have so many problems is chemical. Specifically I’m thinking about lead. There’s a lot of lead in this old city, and it gets in your system and slows down your development. It’s been linked to poor performance in school and higher rates of crime. Naturally with an infant in the house I’ve been mighty worried about lead. I hear horror stories from neighbors who find their kids test way over the limit. So we had our house tested a while back, through ACORN, and sure enough they lead-based paint on the exterior and also in one interior room. That was the bad news. The good news is we qualify for their lead abatement program. We’ve been waiting and finally our number’s come up. So next week I’m shipping the wife and daughter up to Indiana (hope it dries out a little by then) as a crew of volunteers swoops down on our house and does some remediation and then a fresh paint job. Therefore I’m revisiting our color consultation from two years ago and trying to make some decisions. It’s just a matter of picking your color and going for it. I know that can be the hardest decision though. Take the photo of the house, or a newer one to Lowe’s. Probably non peak hours are best, and talk to the most experienced person in the paint department. They should be able to run the software that will take that picture and allow you to color it in various ways. Mostly they want to sell the software, or did, but if there’s someone there with the time, they’ll walk you through it with your photo. You can do your own color consult electronically and see what you like on your house without getting the paint gun dirty. I still favor Louis Aubert’s suggestions and Scott’s reminder to paint the porch ceiling an anti-wasp blue. Chemical, I think, is one of the worst things the poorer people of New Orleans have to deal with. Years ago, the soil in the neighborhood was tested and loaded with chemicals. Press Park and the surrounding neighborhood are also on top of chemicals. Who knows what else is under the ground, much less under the paint? FWIW, we didn’t get a color consultant for our house. My wife and her mom chose lavender. Ugh. Two words: paint samples! It is worth every penny to pay a little up front for a quart of a couple of colors. The unused can be blended into the paint for the under coat. Every color will look different on different houses (hell, different sides of the same house) due to various environmental factors. Generally light colors on the chip tend to appear much lighter on a house and the darker ones appear even darker. A lot of colors “drift” that is look like a sunny yellow or warm gray on the chip and look like a school bus or tomato soup on the house (which is where most of the horror stories originate). A good starting point is to compare the colors you like on the chips to the paint on actual houses you see around town. The control of lead is the control of dust. Reasonable precautions while scraping and sanding can take care of most of the problem, most of it involves the use of tarps to collect the dust. A good precaution is to run the blue painters tape around the cracks in your windows and doors to keep the dust from getting in while the siding is being sanded. When they are finished, vacuum the whole place, particularly around the windows/doors and then wipe everything down with a damp cloth. Remember, you are after the fine dust. With an infant, I wouldn’t take any chances, good idea to keep her away during the process. We’ve lived in older houses but not ones under renovation. Abe’s lead test is low enough where there is no problems. Every time there is work that disturbs the paint we have found to have lead I get him out of the house and do extensive cleanup after with dry vac and wet mop. I have even dry vacced our lawn. We downloaded and watched the video of The Lead Police. The full video is currently available as a free video download from Sesame Workshop via the iTunes Store as part of the Learn Along with Sesame series. Look at using “PeelAway” it was designed for lead paint removal. It took off 15-20 layers of paint off our 108 year old house. It one of the safest paint strippers out there. 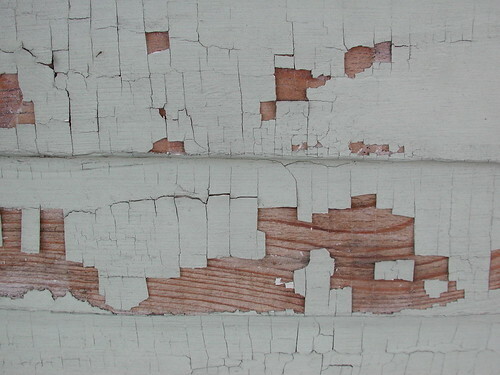 Use a very good primer to seal any lead paint left. Also drink lots of milk, take calcium, selenium, magsesium tablets to chelate the lead in your system. Wipe down surfaces with a damp rag don’t vacuum the dust up. Have you consider Low VOC Interior paint such as Harmony?